Spring boat shows are back in full force this weekend, with events all over the world. We've highlighted all of this weekend's nautical events below; and, as always, you are welcome to jump ahead to the First Boat boat show calendar for a quick look at the lineup of boating events this weekend and beyond. Milford, Connecticut, nestled on the shoreline of Long Island Sound, is home to the SailQuest boat show this weekend. More info. If you happen to be in or near Lebanon this weekend, we highly recommend the Beirut boat show, Beirut Boat 2012, which started this past Wednesday and runs through Sunday. Their country's economic turmoil may be making headlines, but the 10th edition of this in-water yacht and accessory show is going on in Kallithea, through Sunday the 20th. If you are in Biloxi, Mississippi, check out the classic boats at this event, Saturday and Sunday only, at Schooner Pier Complex. Marina del Rey, California, is the home of MarinaFest on Saturday and Sunday, which is being billed as "a community-based waterfront celebration of the boating lifestyle with interactive, hands-on activities for all ages and levels of boating." 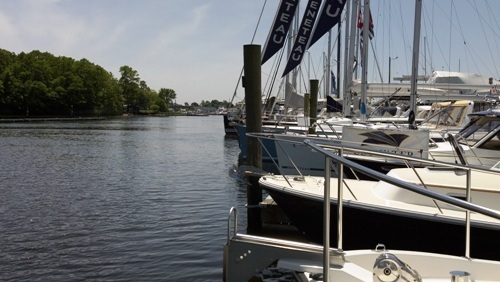 Hilton Head Island, South Carolina, is home to Windmill Harbour's 8th in water boat show with over 35 boats on display.